Crime Scene at Lockheed-Martin, King of Prussia, Pennsylvania, August 6, 2011. Photo by Rich Conti. After stringing crime scene tape across the main driveway entrance and attempting to deliver Japanese photo packets from Hiroshima/Nagasaki to the number one war profiteer and nuclear weapons maker, ten people were arrested and released on a disorderly conduct citation: Fr. Patrick Sieber, Robert M. Smith, Mary Jo McArthur, Bernadette Cronin-Geller, all of Philadelphia; Mary Ellen Norpel, Ambler, PA; Robert Daniels II, New Tripoli, PA; Tim Chadwick, Bethlehem, PA; Paul Sheldon, Drexel Hill, PA; Theresa Camerota and Tom Mullian, both of Wyncote, PA.
About 75 people attended an August 9th Nagasaki Day memorial vigil and nonviolent direct action at the Livermore nuclear weapons lab in California. A die-in at the gate ended with the arrest of 20 people, who were cited and released. L to R: Theo Kayser, David Omondi, Fr. Louie Vitale, OFM, Jeff Dietrich, Jesse Lewis, Mariah Klusmire - Vandenberg AFB, August 6, 2011. Photo courtesy Vandenbergwitness.org. On August 6, forty Catholic Workers and friends gathered at the front gate of Vandenberg Air Force Base to commemorate the 66th anniversary of the bombings of Hiroshima and Nagasaki. The base, on the California coast near Lompoc, is where test launches of nuclear missiles and missile interceptors are conducted. Near the end of the vigil, six people – L.A. Catholic Workers Theo Kayser, David Omondi, Jeff Dietrich, and Jesse Lewis, Guadalupe Catholic Worker Mariah Klusmire, and Fr. Louie Vitale OFM – crossed the line and knelt down to pray for peace and a disarmed U.S. Empire. 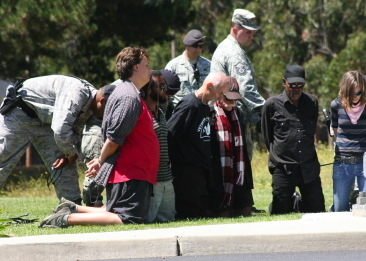 They were arrested, taken to a building on the base, cited and released. All have pending court dates. Life-size inflatable missile used to block road into the Kitsap-Bangor nuclear submarine base, August 9, 2011. Photo by Leonard Eiger. 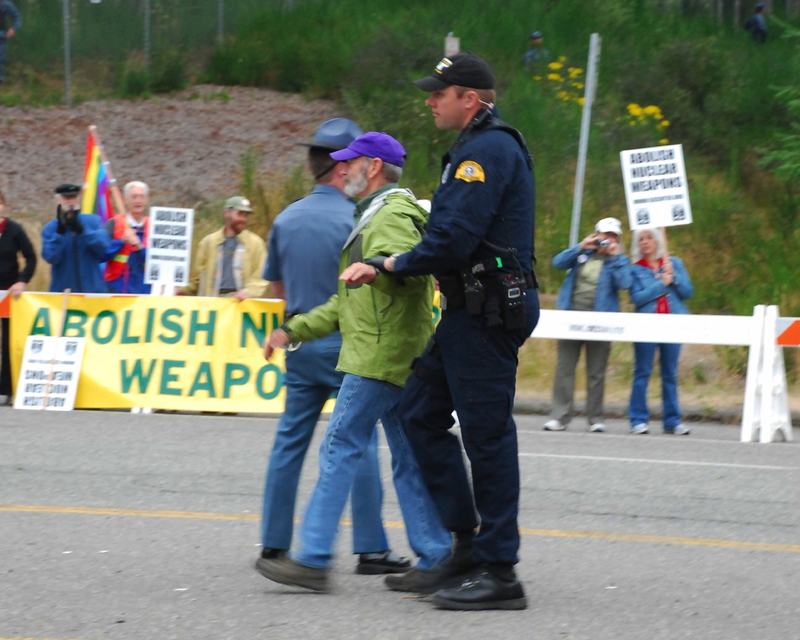 Four peace activists were arrested August 8 while attempting to block the entrance to the U.S. Navy’s West coast Trident nuclear submarine base. The eight Trident submarines based at Bangor, just 20 miles from Seattle, contain the largest concentration of operational nuclear weapons. Each submarine carries 24 Trident II (D-5) missiles, each capable of carrying up to 8 independently targetable warheads. Each nuclear warhead has an explosive yield of between 100 and 475 kilotons (up to 32 times the yield of the Hiroshima bomb). Members and supporters of Ground Zero Center for Nonviolent Action in Poulsbo, Washington commemorated the anniversaries of the atomic bombings of Hiroshima and Nagasaki by vigiling at the New Main Gate entrance to Naval Base Kitsap-Bangor. Rev. Anne Hall of Seattle, WA; Betsy Lamb of Bend, OR; Brenda McMillan of Port Townsend, WA; and Tom Rogers of Poulsbo, WA, entered the road with an inflatable, full-size model of the Trident nuclear missile during the early morning rush hour, symbolically closing the base. They were arrested, processed at the scene, issued citations for “pedestrian on roadway unlawfully,” and released. Tom Rogers is a retired U.S. Navy Captain who once commanded a nuclear submarine. 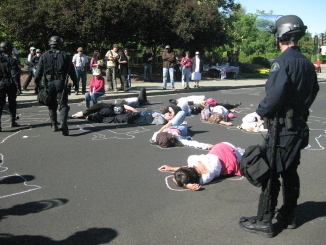 Although active in Ground Zero for many years, this was Rogers’ first nonviolent direct action. Following the action, Rogers remembered Sr. Jackie Hudson, longtime peace activist, nuclear abolitionist and member of Ground Zero, who died a week earlier. He said that Jackie had a big impact on him and that she helped him to take that first step outside of his comfort zone, and then go just a little further. Hiroshima-Nagasaki Faith and Resistance Retreat Report from Washington, D.C. Focusing on the theme: “Remember the Pain, Repent the Sin, Reclaim the Future,” about 25 people attended the annual Hiroshima-Nagasaki Faith and Resistance retreat in Washington, D.C. sponsored by Jonah House and the Dorothy Day Catholic Worker. The retreat included prayer, viewing the compelling new film, “The Forgotten Bomb,” presentations on the U.S. Bomb complex and the drone and Trident weapons systems, and three nonviolent actions. On August 9, the anniversary of the U.S. nuclear bombing of Nagasaki, and the martyrdom of Sr. Edith Stein and Franz Jagerstatter, the community held two actions, at the Pentagon and White House. At the early morning Pentagon witness, Catholic Workers Amber and Kevin Mason and Bill Frankel-Streit, peace activist Rosemary Thompson from Baltimore, and Sr. Margaret McKenna from the New Jerusalem community in Philadelphia, were arrested as they stood outside the designated protest area near the visitor’s entrance, holding photos of the A-bomb victims and a banner that read “No More Hiroshimas and Nagasakis.” Following their arrest, other retreatants who were in the designated protest zone read the entire Original Child Bomb by Thomas Merton, as well as the account of a Nagasaki survivor. Selections from the writings of Franz Jagerstatter and Sr. Edith Stein were also offered. Later at noon at the White House, the community offered a similar action as was held at the Pentagon. During this witness many of the same readings were offered, as well as a recent quote from the Apostolic Nuncio to the U.N. stating there is no longer any justification for nuclear weapons. Songs were also sung remembering the victims of Hiroshima and Nagasaki. An urgent appeal was made to abolish all nuclear weapons and war, to stop construction of new bomb facilities at Oak Ridge, Los Alamos and Kansas City, and to redirect all the money and resources wasted on modernizing the U.S. bomb complex to instead meet urgent human needs. We also invoked the names of all the peace prisoners and recounted their life-giving actions for a world without weapons and war. We continue to keep our eyes on the prize as we strive together to forge the beloved community.